APPLY TO THE IOU-NA PROGRAM! CIAN is the Center for Integrated Access Networks, an Engineering Research Center (ERC) funded by NSF that consists of research labs at 10 different universities. CIAN offers a 10-week summer program designed for undergraduate Native American students interested in exploring optics and photonics, as well as hydrology, soil sciences, atmospheric sciences, or environmental sciences. (See a slideshow of the Summer 2014 IOU-NA at the bottom of this page). 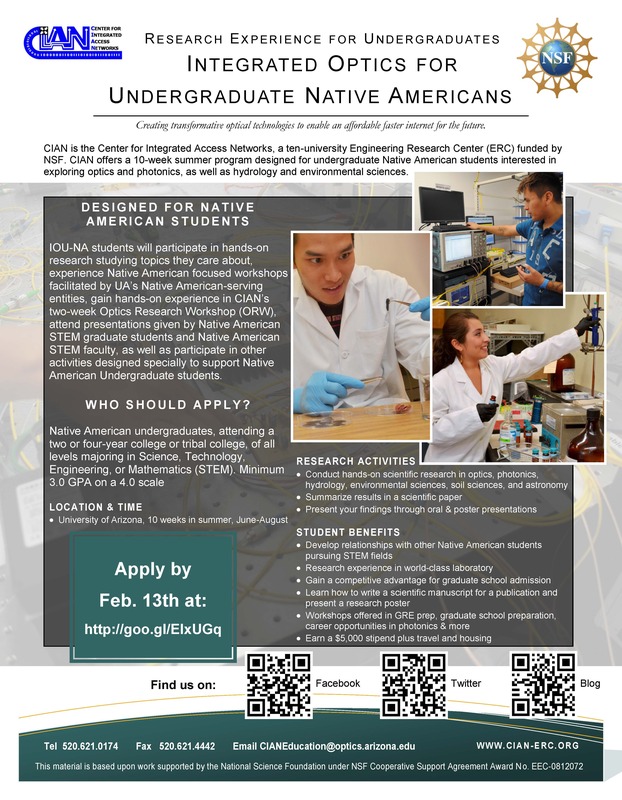 The Integrated Optics for Undergraduate Native Americans (IOU-NA) Research Experience for Undergraduates (REU) program is designed for Native American students interested in participating in hands-on research opportunities in top laboratories in optics and photonics, as well as in hydrology, astronomy, soil sciences, atmospheric sciences, and environmental sciences. 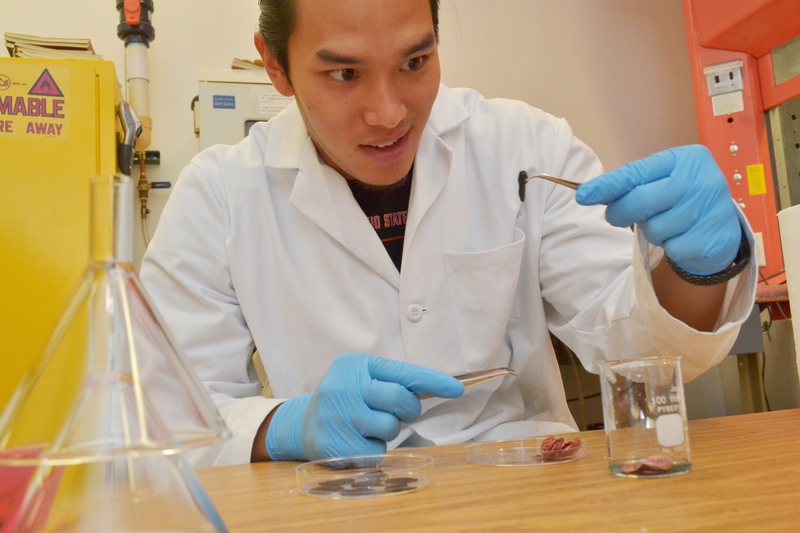 Selected students are paired with a research project complementing their interests and goals. IOU-NA students will also participate in Native American focused workshops facilitated by University of Arizona’s Native American-serving entities, gain hands-on experience in CIAN’s culturally relevant two-week Native American focused Optics Research Workshop (ORW), attend presentations given by Native American STEM graduate students and faculty, as well as participate in other activities designed to support Native American Undergraduate students. A stipend of $5,000 is available for successful participation in the full 10-week program. Additionally, travel to and from the university at the start and close of the program will be covered as well as housing on campus during the 10-weeks of the program. 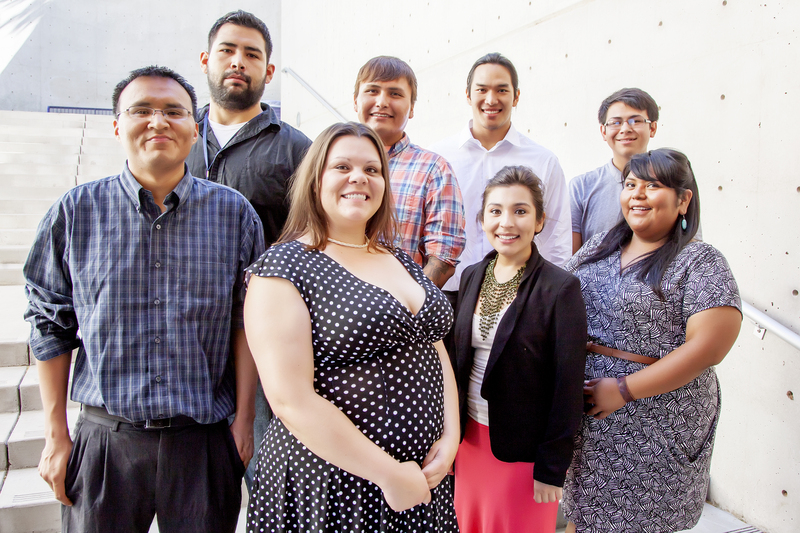 Native American undergraduates, attending a two or four-year college or tribal college, of all levels majoring in Science, Technology, Engineering, or Mathematics (STEM). Minimum 3.0 GPA required, on a 4.0 scale. US Citizenship or permanent residency is also required. May be mailed to CIAN in a sealed and signed envelop by the letter writer, or emailed directly by the letter writer. Please give your letter writer this form to complete. This entry was posted in Education, Industry & You, Research and tagged atmospheric sciences, College of Optical Science, environmental sciences, hyrdology, Native American, Optical Sciences, photonics, professionalism, research, REU, soil sciences, STEM, University of Arizona. Bookmark the permalink.